iPXE images can be built using the rom-o-matic site. rom-o-matic may not support all possible options and can be slow - downloading the source code from a git repository and building locally is an alternative option. liblzma or xz header files..."
An ubuntu Live USB with persistent storage can be used as an alternative to PXE booting ubuntu from a NFS share - allowing ipxe to be built on rebooting the device without having to re-run the above commands. Configuration files with *.h filenames (e.g. Home/ipxe/src/config/general.h) can be edited with a text editor to enable/disable features. The majority of options are contained in Home/ipxe/src/config/general.h (see here for a copy (cloned from the ipxe git repository on 16/2/2017)). Any lines in a configuration file starting with a # (hash) will be processed - e.g. Any lines in a configuration file starting with // (2 x Forwardslash) will NOT be processed - e.g. Any lines in a configuration file starting with #define will enable a feature - e.g. Any lines in a configuration file starting with #undef will disable a default feature - e.g. The example below walks through the steps required to enable CONSOLE FRAMEBUFFER support - if CONSOLE FRAMEBUFFER support is enabled, PNG images can be used as menu backgrounds and higher resolutions are supported. There are a range of other CONSOLE options that may be of interest - see here. Make any required changes to the configuration files (see above) and then start a terminal in the Home/ipxe/src/ directory. The resulting binary will contain all native drivers for supported Network Cards. ...the resulting files (which can be found in Home > ipxe > src > bin path) will now include support for any additional commands/protocols/features enabled in the configuration files. ...the resulting files can be located in the Home > ipxe > src > bin-x86_64-efi path. An iPXE binary containing just the driver for a specific Network Card can be created - the resulting binary will be significantly smaller in size. This is covered below and also in the Burning iPXE into ROM page on the iPXE site (here). You will need to identify the Vendor and Device IDs for your Network Card. 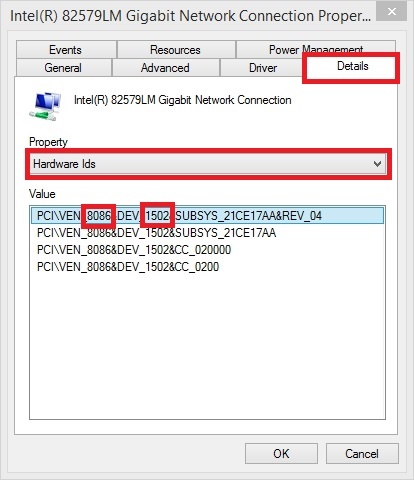 On Windows, open Device Manager > expand Network adapters > identify the adapter from the list > right-click and select Properties. Based on the information displayed in the screenshot above, the Vendor ID is 8086 and the Device ID is 1502.